Potato salad as the name suggest is a dish made out mainly of potatoes. It may be called a salad but it is a side dish which is often served with mains like: barbecues, roasts and fried chicken. There are lots of versions of this popular salad where ingredients varies from different regions. It can be served cold, warm, or hot with different options of dressings that you can choose from like mayonnaise, sour cream to vinegar for some. Potato Salad origin dates back to the early 16th century and was traced by Arnold Shircliffe, the executive chef of Edgewater Beach Hotel in Chicago. According to his notes “Early potato salad: John Gerrard in 1597 writes about potatoes and their virtues and said that they are sometimes boiled and sopped in wine. Some boiled it with prunes. Others dress them (after roasting the potatoes in the ashes) with oil, vinegar and salt. However they be dressed; they comfort, nourish and strengthen the body. (to which of course we can all agree on)” This is one of the first potato salads mentioned in any book. Potato based salads where introduced in America by European settlers as they brought over their traditional dishes to the country but adjusting its ingredients to adapt to what is available to them. There were two types initially and it was the cold style where it originated from the French and the British and the warm potato salad using vinegar was from the Germans. It then became popular in the mid-19th century. For this post we will be making the cold version which is a simple combination of potatoes, bacon, eggs and slices of radish for texture and colour. How about you, do you have potato salad versions that you can share? Bring a pot of water to a boil, add salt and potatoes. Cook potatoes for 10 – 15 minutes or until tender. Once cooked drain then set aside. While potatoes are cooking cook bacon in a pan with a small amount of oil until crispy, remove from pan then drain on paper towel lined plate. In a bowl combine sour cream, sugar, mayonnaise and mustard. Season it with salt and freshly ground black pepper. Place potatoes, bacon, radish, egg, pickles and onions together in a separate bowl then add the bowl of dressing. Toss well then place in the refrigerator for at least an hour before serving. I love potato salad and love the addition of bacon. I could eat potato salad as a meal all on it’s own. A BBQ without potato salad is like an opera without the Aria, implausible! A delicious use of fresh crunchy radishes, a much nicer edition thn stewed prunes no doubt! i love the way you present the salad..
You put the cherry belle radish as a last touch, well done Raymund!!! 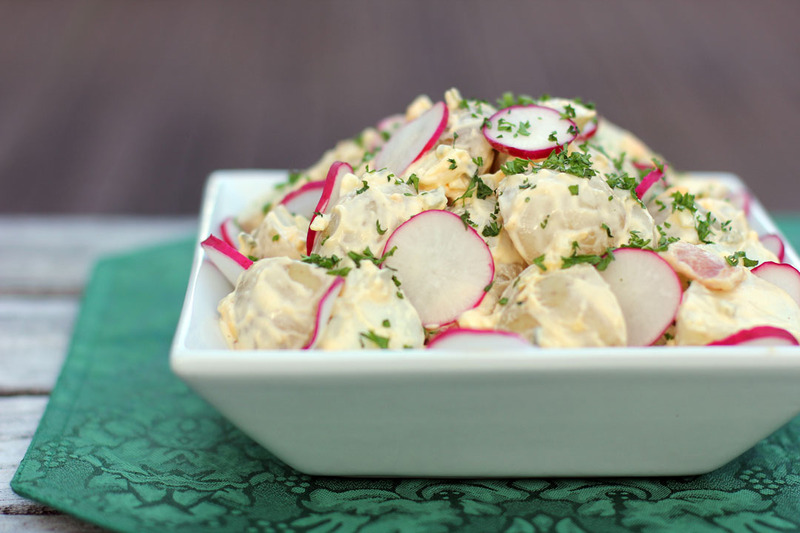 Potato Salad – Well, that sounds like a pretty “ordinary” dish coming from you, the king of the non-ordinary. However, you certainly did make it special with the bacon and radish. Might have to thrown this one together for Memorial Day. Thanks! The Julia Child version is the one I almost always make, because my mother did. http://bit.ly/11a8cR1 But, I love your addition of radishes. Pretty, and delicious! 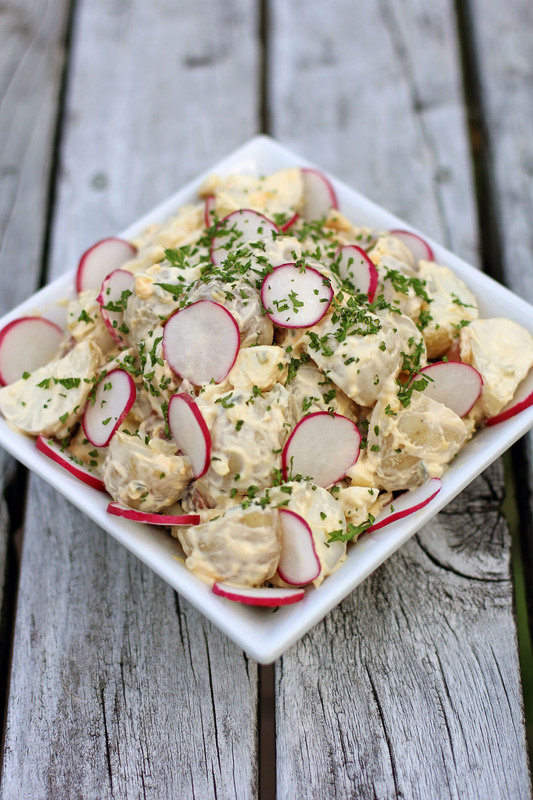 I have always loved potato salad…Yours looks perfect to be eaten by itself or with hot dogs and sandwiches!!! Love the addition of the radishes! What a beautiful looking salad !